Would you like to sample 14 recipes from my new cookbook? 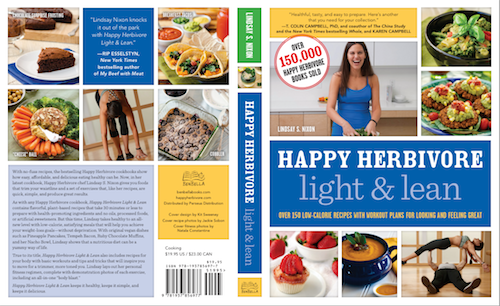 And would you like to get Happy Herbivore Light & Lean in NOVEMBER instead of December (Official release date Dec. 3rd 2013)..... ??? Rumor also has it that preorders are going to ship a few weeks early, so instead of waiting by the mailbox on December 3rd, you can wait by the mailbox in mid-November! (Less than a month away!!) You have to preorder to get the book early, however. (For the latest details and updates on the book and when it's surfing through postal system, signup for the Happy Herbivore newsletter — it's free!). Of course I can't guaranteeyou'll get it early, but the little birdie that told me is pretty darn trustworthy (and cute!) and with my last two books, preorders shipped several weeks early, so I'm pretty optimistic my feathered friend is correct once again. One last push: HHC, EHH *and* HHA all sold out within 24 hours (knock on wood! ), so you want to preorder just to make sure you'll get a copy! On a happier note: preordering ensures you'll get the lowest price! And YES, you can preorder the ebook version for your Kindle and Nook! Check iBooks from your device, too. (*Digital versions probably won't "ship" early, however. I have no insight or control over ebooks — they're released when Amazon, Apple, and B&N wants to release them, which means sometimes it's before the "official" date and sometimes it's after. I only have insight about the preordered physical books because they're in my publisher's/distributor's control.) Preordered ebooks still qualifies you for the free recipe goodness now though! PLUS (this is where I beg! ), it's my super dream to be a New York Times bestseller and preorders give me the best shot — so help a Herbie out and Preorder HHL&L now! :) :) pretty please! You can also preorder through Barnes & Noble, or Book Depository if you're international (they ship worldwide). ....and if you can support a local bookstore, please do! **Due to the high volume of submissions, please allow my publisher 1-2 weeks to process all requests. !!! CALLING ALL BLOGGERS !!! I'm going to go on a pre-tour and another official blog tour with HH L&L. Any blog/blogger is welcome to participate, but you must be willing to publish the tour post on an assigned day (from Oct. 15-Nov. 2 for the pretour; Dec. 1-Dec. 31 for the regular tour). Goodies in store for my hosts as always! Thanks, Herbies! I'm soooo excited for L&L's arrival!